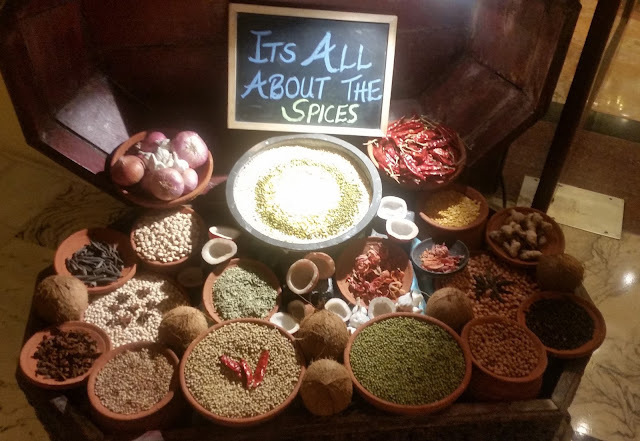 Ever since Andhra Pradesh has been bifurcated and Hyderabad has been designated as the capital of Telangana, there has been a slew of festivals showcasing the cuisine of the newborn state. As a result of this, many delicacies and hidden recipes from this region have been unveiled to the food lovers of the city. 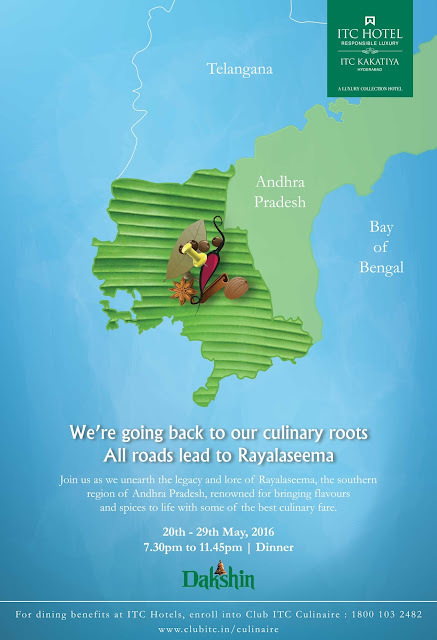 Dakshin, the signature South Indian restaurant at ITC Kakatiya has now taken the initiative to present the cuisine of Rayalaseema, another Telugu-speaking region of the country. Sous Chef Sankara, who is credited with successfully popularizing Telangana cuisine by organizing food festivals all over the country is the man behind this initiative too. 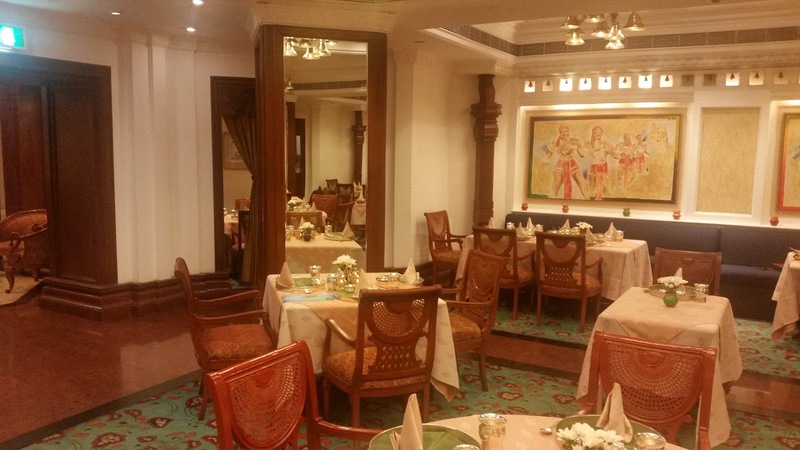 At a preview of this festival, Chef stated that the dishes in this festival are presented as set thalis – vegetarian, non-vegetarian and seafood, as per the usual custom at Dakshin. Rayalaseema cuisine has its own delicacies, the most popular being Ragi Sangati, a millet, and broken rice combination which is famously savoured with country chicken and ghee. The cuisine is also one of the spiciest, using the chillies from Guntur as well as Karnataka. 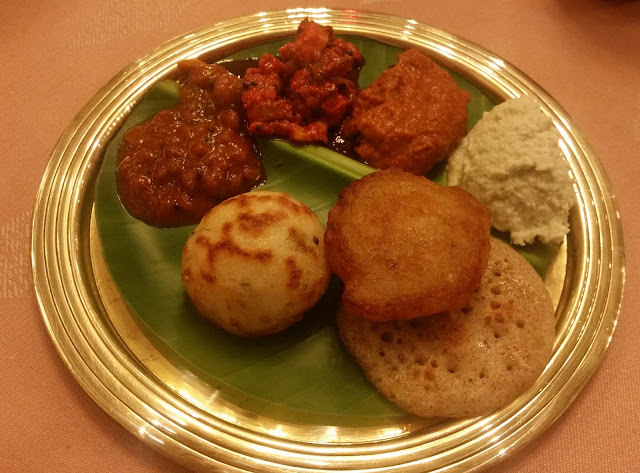 The influences of the Tamil and Kannada cuisines are also very pronounced as the region is close to these states. We started our journey with Nimmakai Neelu, a lemon based cooler. 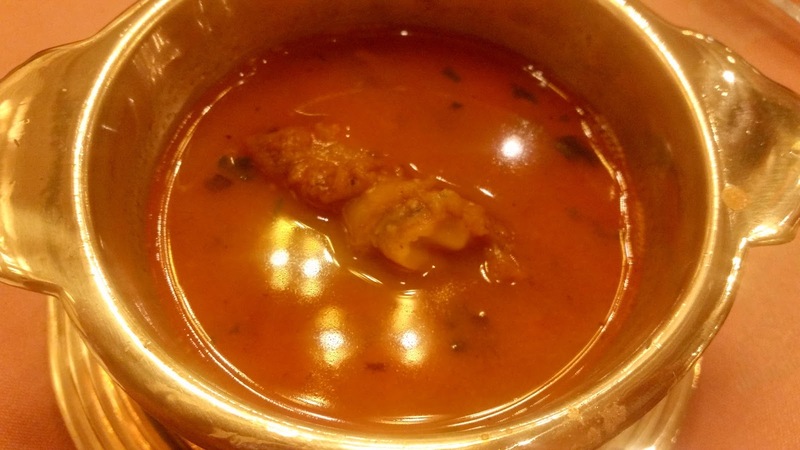 The Meka Kalla Rasam or paya soup with black pepper which followed, was quite firebrand with lamb trotters providing a distinct flavour to the soup. Whenever I visit Dakshin, I look forward to the goodies from the Iyers Trolley, and today was no different. Apart from the coconut, ginger and mango chutneys, a peanut chutney from Rayalaseema was served to us which was a clear winner. I missed my favourite Vankai Gochu (brinjal chutney) though. The staples were the usual Banana dosa, and Paniyaram. Royyala Kothimiri Karam (Prawn Fry in a coriander based masala) was the pick among the starters. 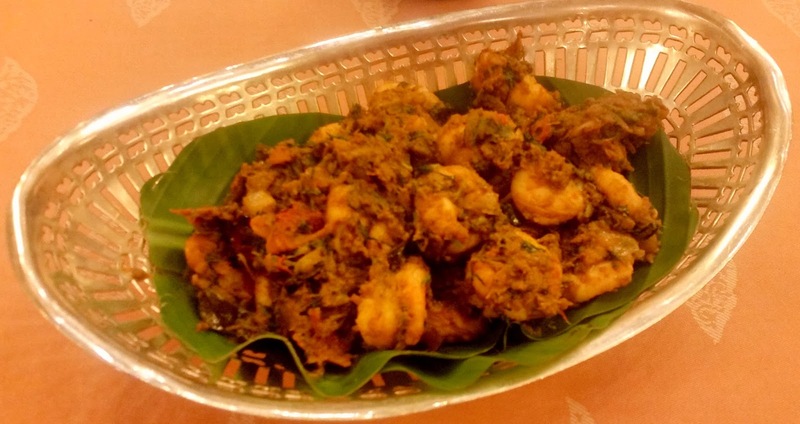 The green masala, which complemented the fresh prawns well, was spicy enough to give a fair idea of the amount of chillies used in a Rayalaseema preparation. Chef Sankara had curated a special thali for the bloggers meet incorporating dishes from all three versions. The staples included Egg Paratha and Korala Sangati. In the latter fox millets are used instead of broken rice in the more popular Ragi Mudda. 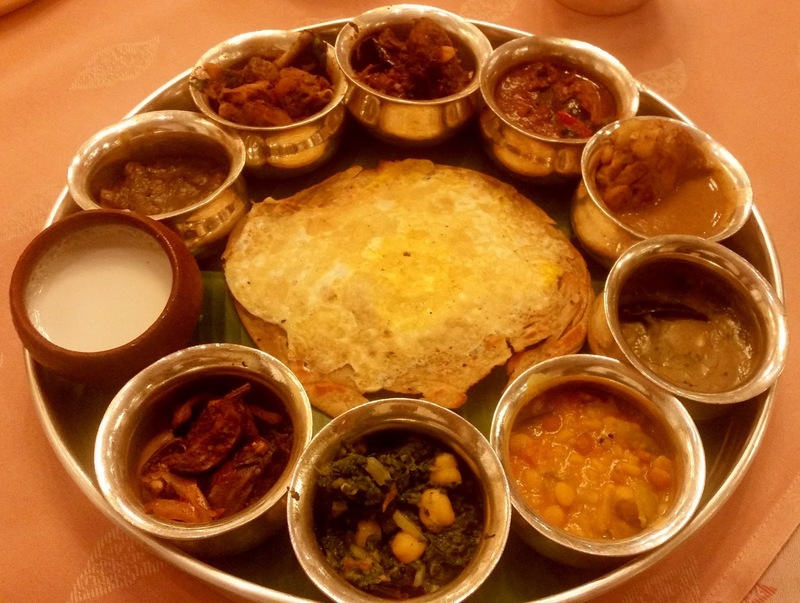 Among the vegetarian dishes served in this thali, Vankai Vepudu, a brinjal and methi dish tasted good with the egg paratha. A spinach based dish Pulla Koora was a rice friendly preparation. And then there was Dahi Wada. The last came as a surprise to me as I thought that it is primarily a North Indian recipe. Rayalaseema is a landlocked area with very few rivers. As a result dried fish is usually available and popular in this area. Chef had served Endu Chapa Vankai Pulusu, a tangy tamarind based preparation of dry anchovies with brinjal. The dish was spicy enough to underwhelm the strong smell of dried fish, without sacrificing the taste. With the Korala Sangati, I tried Kodi Korma, a cashew, and coconut-based chicken curry. In Andhra Pradesh, dishes involving lamb organs or offals are usually delicious – Gongura Boti or lamb intestines in sorrel leaf masala was the dish of the day. The Chef’s mastery in the cuisine is evident from the dish, where the strong gongura flavours made it palatable even to the uninitiated. To go with this dish, we had some hot Appams delivered from the Iyer’s Trolley. Another dish which came out very well was the Kyama Pulao. The mutton mince was perfectly cooked, and the rice had soaked in the masala well. The right combination of spices has resulted in a delicate and flavourful dish. The desserts in the thali had Semiya Sabudana Payasam and the customary curd which is served with any meal of this region. 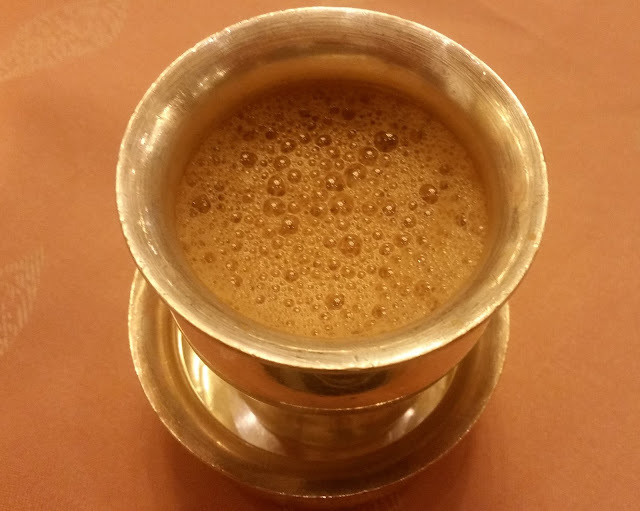 A cup of filter coffee was the ideal thing to end the meal with. The promotion is on till 29th May, both for lunch and dinner. The veg, non-veg and seafood thali cost Rs 1500, Rs 1800 and Rs 2200 respectively. Taxes are extra.